This month’s mommy dinner was Saturday, an early kick-off for Mother’s Day! We were a small group with many moms unable to attend– entertaining visiting relatives, attending college graduations, etc., but a more intimate group was a nice change from the larger group. (We get pretty loud)! This month I decided to try my hand at Belgian food: fondue (which I knew how to prepare) with my homemade French bread, beef carbonnades (first time to make), Belgian frites (double fried!) and Belgian waffles for dessert. I’ve been working on a two-part artisan bread blog; my go-to book is Peter Reinhart’s “The Bread Baker’s Apprentice.” I made my first yeast bread (plain old sandwich bread) when I was nine, so I’m comfortable with yeast dough; however, my family– particularly Grace and Kurt, have been bugging me to learn to make those artisan baguettes that are filled with big holes, soft bread and a crunchy crust. I have not yet fully mastered the technique, but I’m getting there. Even if you’ve never made yeast bread before, you can make this if you pay attention to the steps. 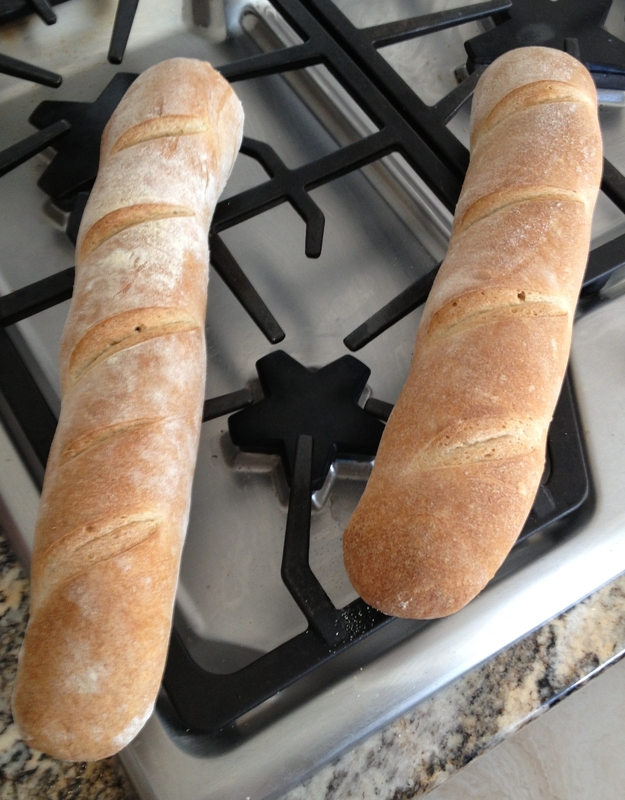 Once I decided to give myself a break from baking holey breads, I began working with the recipe for French bread– the standard baguette. The guys and my mom LOVE this bread. Ken won’t touch my homemade sandwich bread when this loaf is available. The recipe requires a “pre-ferment,” or starter dough that you make a day ahead of time. Pre-ferments significantly boost the flavor of your baked bread since they sit overnight, allowing the yeast to grow slowly (“retard”). I’ve used two pre-ferments: pate fermentée and poolish. For French baguette, pate fermentée works great, for ciabatta (that flat, slipper-shaped Italian loaf filled with holes), poolish is better because it has a higher water to flour ratio (“hydration”) than the pate fermentée. (Highly hydrated doughs result in those super-holey loaves, but they are a challenge to rise properly and form into loaves). Pate fermentée is easy to make; it’s a batch of bread that you rise a little bit, then put in the refrigerator overnight. When I make it, I use a kitchen scale to measure the flours; it’s more accurate and by using weight instead of volume, and you can easily multiply the recipe to however much pre-ferment you want. I use all King Arthur flours for my baking because I find my baked goods are so much better with this brand. 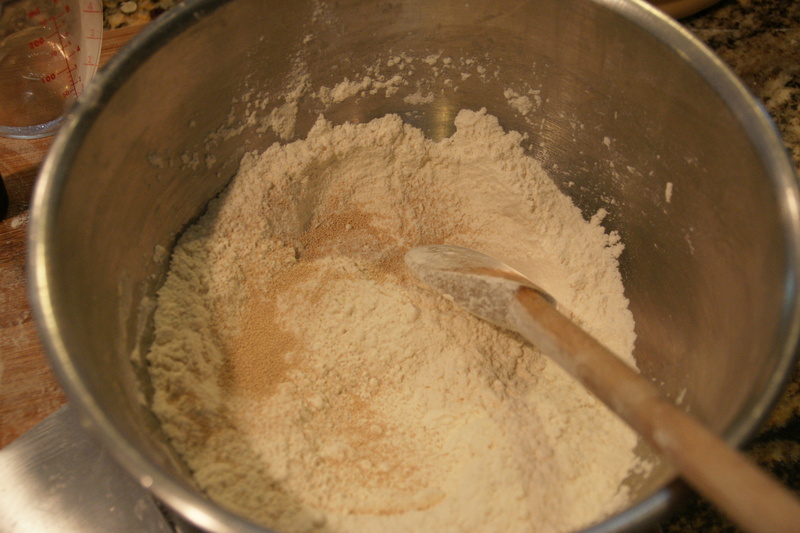 Mix the flours and salt together in a medium mixing bowl, then sprinkle the yeast on top. Add about 1/4 c of the warm water (I tend to measure the water just before using it so it doesn’t cool down) to the flour mixture and stir with a wooden spoon. 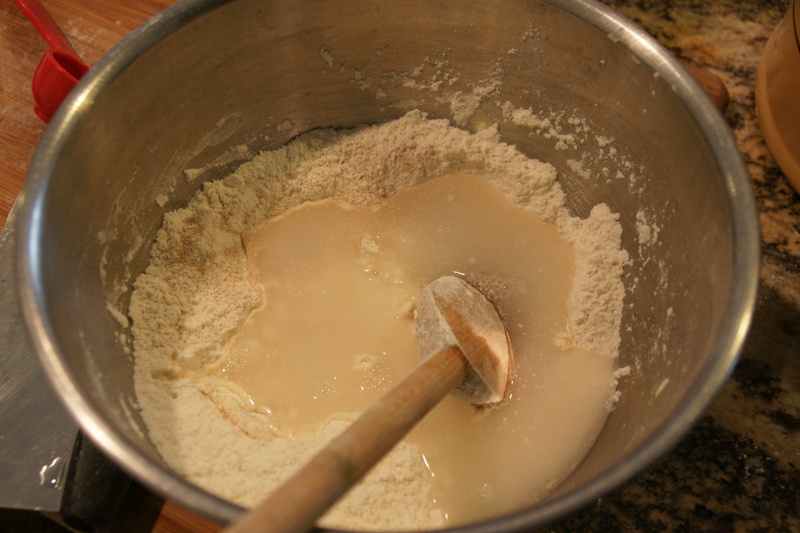 Make a well in the center of the flour mixture and add more water. 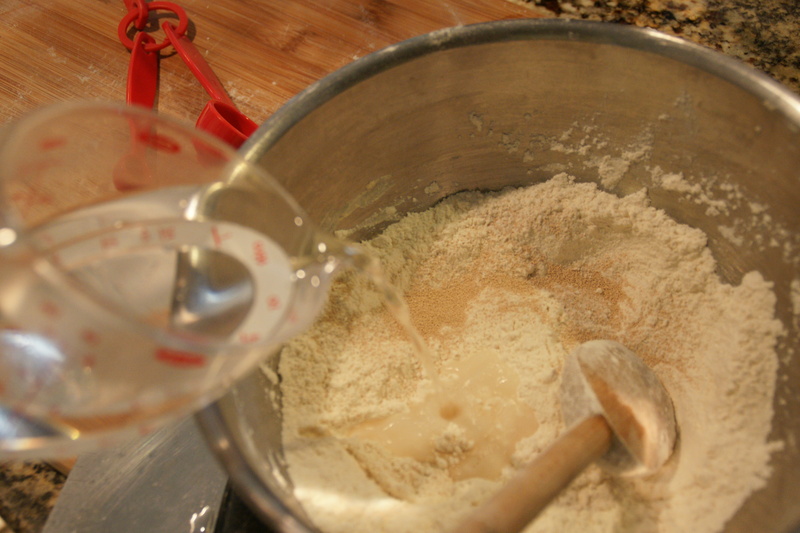 Make sure you pour the water into the center of the flour. Continue to stir the dough; it will pull together in ragged sheets or clumps at first. Continue to add water as needed; you’re aiming for a dough ball that pulls away from the sides of the bowl, with little flour visible. 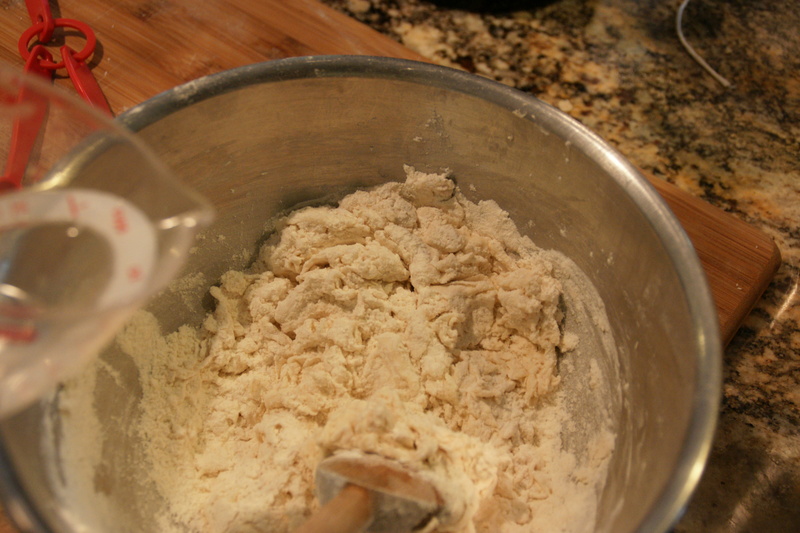 It’s fine to have a slightly sticky dough since it’s easy to add flour to the dough during the kneading process; it’s almost impossible to add water to the dough once you begin kneading! Flour a large board or other surface (flour your hands too!) and scrape dough out onto the board. 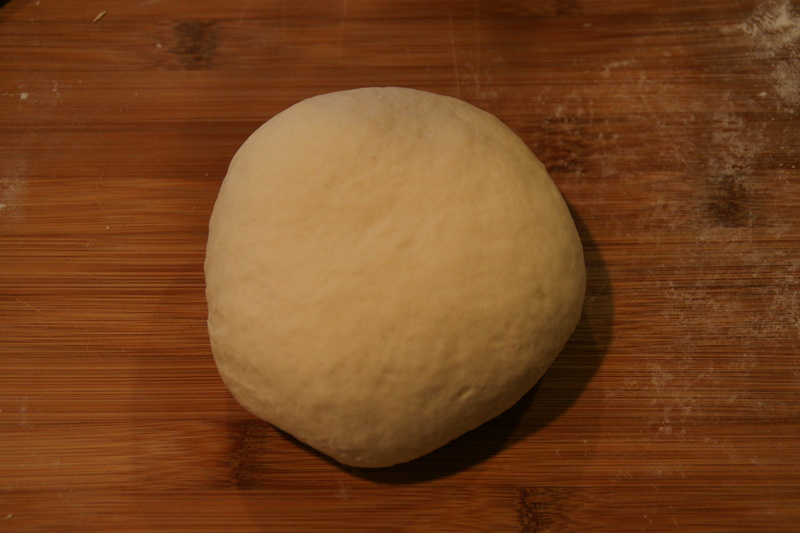 Begin kneading the dough by pulling it into a ball. 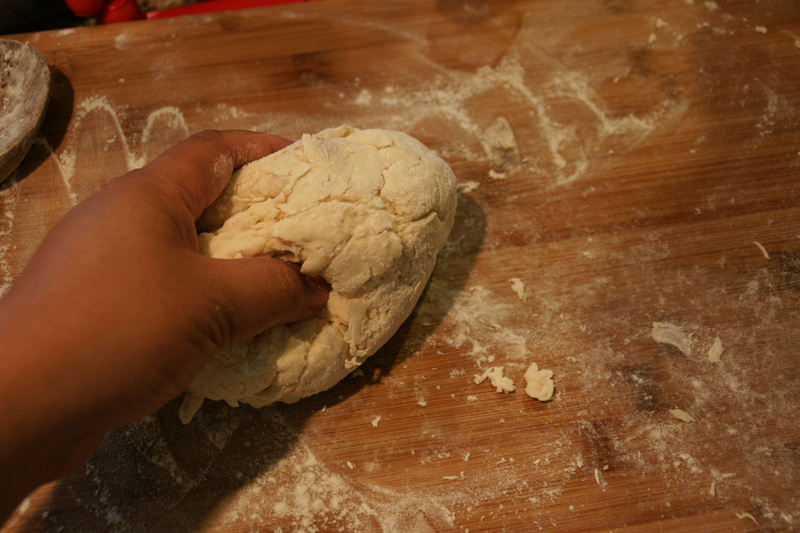 Everyone kneads differently; the goal is to even out the lumps of dough into a smooth ball. The way I do this is to fold the dough ball in half and push it out with the heels of my hands. 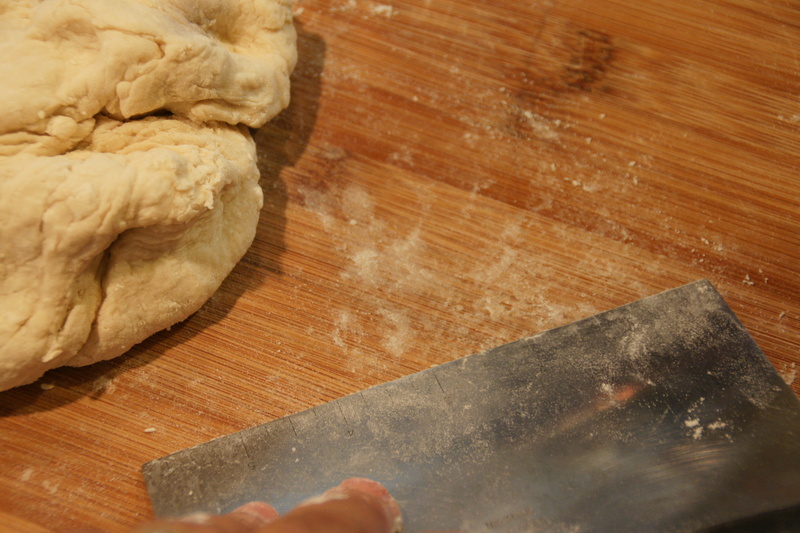 Give the dough a quarter turn and repeat the fold-and-push action. 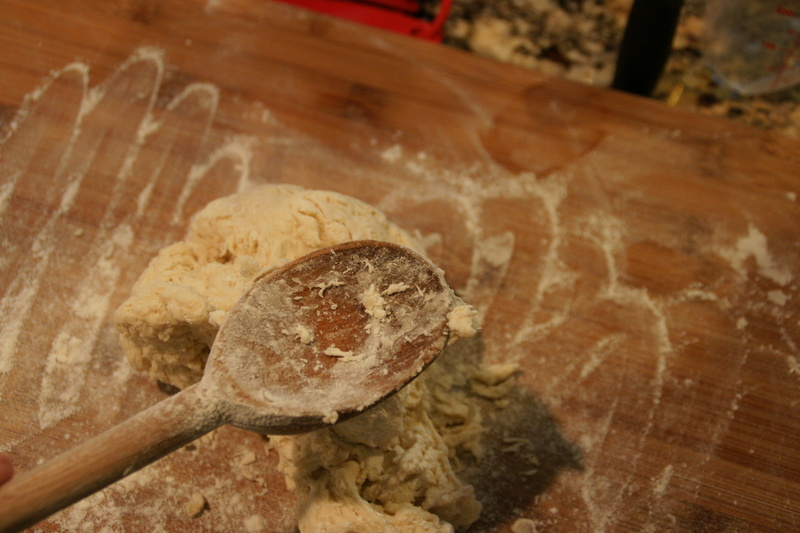 You should use a scraper to pull up any sticky dough bits; add flour a bit at a time if the dough continues to stick. Scrape and flour as needed! When the dough is a smooth elastic ball, you’re done! The entire kneading process takes between 4 and 6 minutes. (You can do this in a stand mixer with the dough hook, too; check after 4 minutes). The dough should be tacky, but not stick to your hand or fingers. If you’re truly anxious, you can test the dough’s temperature with an instant read; the temp should range from 77 to 81 degrees F.
Very elastic with a smooth surface! Spray a large bowl (I used a plastic food container with a lid) with cooking spray. Add the dough to the container, turning it to coat all sides with the oil. The bowl/container needs to be oiled and the dough should be rolled around so its surface is oiled! Cover the bowl with plastic wrap (or snap on the plastic lid) and let rise in a draft-free, dark place (I use a shelf in my pantry or my oven) until the dough has risen to 1 1/2 times its size. This will take about 60 minutes. 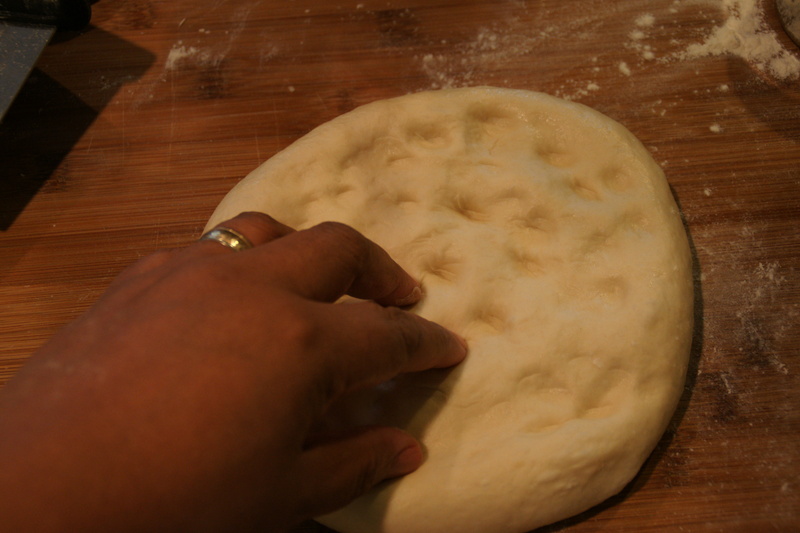 When the dough is ready, place it back on the floured board and de-gas it slightly by pressing on the dough’s surface with your fingertips. Gently de-gas. You don’t want to press all those air bubbles out! 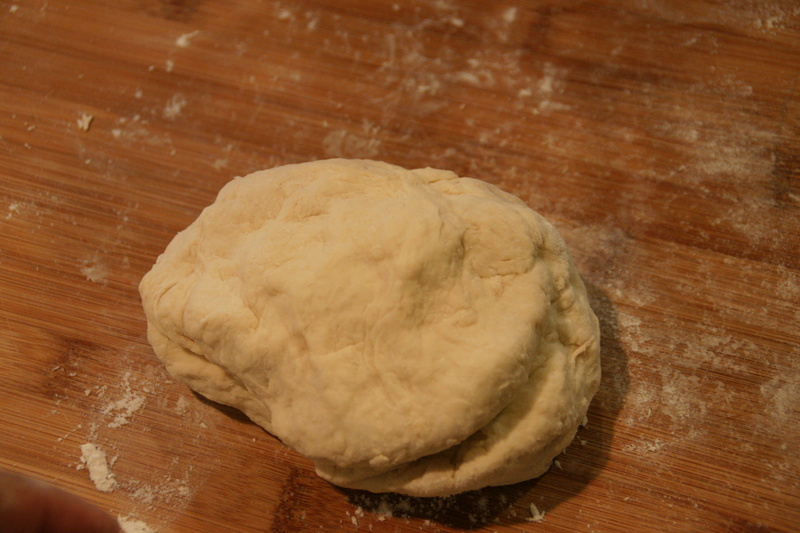 Knead the dough one or two times to shape into a ball. 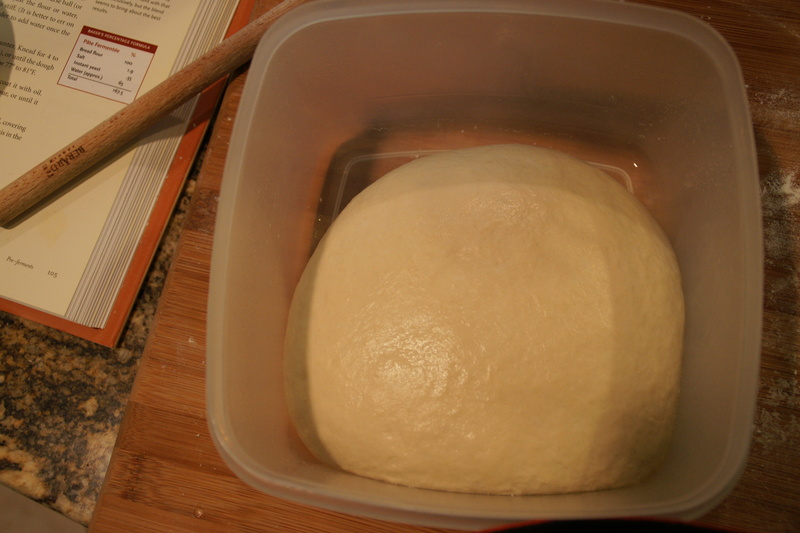 Place the dough back into the bowl, cover it and refrigerate overnight. What’s difficult with bread-making is learning how the dough should feel when it’s ready to begin its rise; hence, I tell folks to start with a wetter dough and add flour as you need. 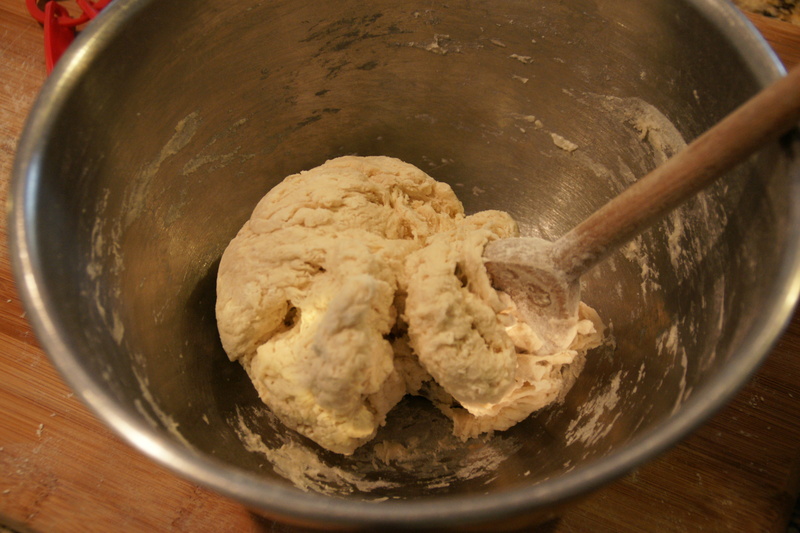 The dough, when ready to rise, is soft and tacky like Play-doh. Keep in mind this is a pre-ferment and will be part of the baguette recipe, so the dough’s consistency doesn’t have to be perfect. Just make sure the flour lumps have dissipated and the dough is soft and pliable. 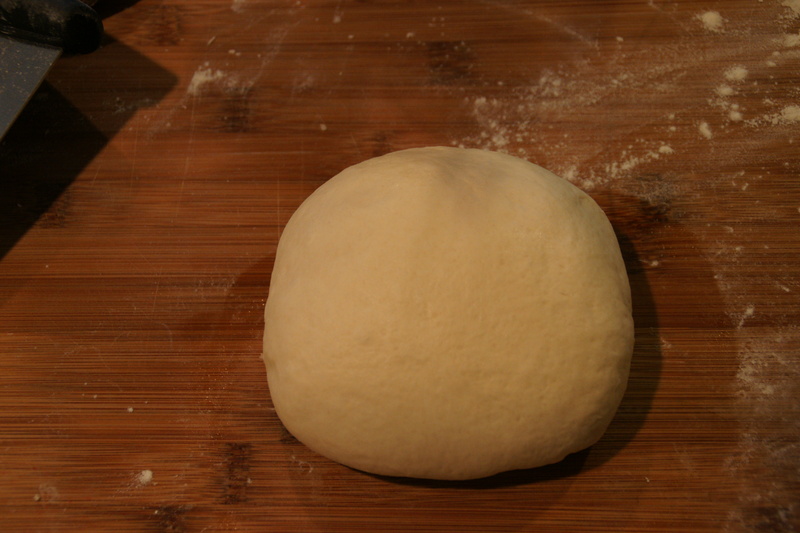 The elasticity is what allows the dough to rise. Give it a try. It’s okay to take a break from kneading if you get tired. Make a lot and freeze it! Let me know how it goes. I love the book and have made other breads from it!